CLAYTON -- Rewards of more than $2,000 are being offered for information about the wasteful killing of five deer earlier this month off N.M. 120 near Yates, a small community in Harding County southwest of Clayton in northeastern New Mexico. 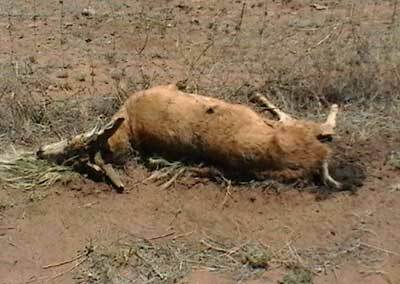 Department of Game and Fish officers found the deer off N.M. 120 near mile markers 97 and 91. The deer were left along the highway and were unsalvageable when officers arrived. Officers believe the deer were shot with the aid of artificial light between 8 p.m. and 6 a.m. on or about June 1. Area law enforcement officers also are looking for those responsible for shooting numerous mailboxes and signs on N.M. 120 near mile marker 116 in Union County in late April or early May. The Department of Game and Fish is offering $1,200 through Operation Game Thief for information leading to charges being filed against those responsible for shooting the deer. Union County Crimestoppers is contributing $500 to the reward. Area ranchers also have pitched in to increase the total reward to more than $2,000. Anyone with information about these crimes is urged to call Operation Game Thief toll-free at (800) 432-4263, or Union County Crimestoppers at (575) 374-9667. Callers can remain anonymous.